ST. PETERSBURG, Fla. — Josh Beckett was lost a year ago at this time, sitting on the disabled list with a bad back and an earned run average of 7.29. The leader of the Red Sox pitching staff spent more time with the trainers than he did with his teammates. Now he’s the best pitcher in baseball. Beckett threw one of the signature games of his career last night, coming one batter away from a perfect game as the Red Sox beat the Tampa Bay Rays, 3-0, before a crowd of 19,388 at Tropicana Field. Beckett faced 28 hitters as only Reid Brignac, who had an infield single in the third inning, reached base. Beckett struck out six and retired the final 19 batters in order. 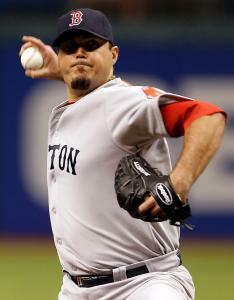 “That’s about as good as you can pitch,’’ Red Sox manager Terry Francona said. Beckett (6-2) has the lowest ERA in the majors at 1.86 and has emerged as the top candidate to start the All-Star Game for the American League. The shutout was Beckett’s first since July 12, 2009, against the Royals and was the first complete game one-hitter of his career. Beckett, who threw 68 of his 97 pitches for strikes, said the idea of being one infield hit away from perfection did not bother him. Until last night, Jon Lester’s no-hitter against the Royals in 2008 was the last time a Sox pitcher threw a complete game and allowed one hit or fewer. Tampa Bay starter Jeremy Hellickson (7-5) went into the seventh inning matching Beckett’s one-hit shutout. Jacoby Ellsbury had a good at-bat to start the inning, driving four pitches foul. On the ninth pitch, he lined to right. The battle with Ellsbury may have tired Hellickson out. Pedroia was next and he drilled the second pitch he saw to right. The ball banged high off the wall as Matt Joyce tried to make a leaping catch. As the ball rolled away, Pedroia had his first triple since last June 20. He felt Ellsbury’s long at-bat played a role in his getting on. Maddon intentionally walked Adrian Gonzalez, who leads the majors with 60 RBIs. Kevin Youkilis came to the plate with one out and runners on first and third. What is usually an ideal situation for a hitter had been anything but for him this season. With a runner on third and fewer than two outs, Youkilis was 1 for 16 with 10 strikeouts and had grounded into two double plays. It made little sense given he was a .433 hitter in such situations previously in his career. Youkilis came through this time, jumping on a fastball. The soaring drive just cleared the wall in left for his 10th home run. “I tried to hit a ball to the outfield. I was very fortunate to get a good piece of it and get it out of there,’’ Youkilis said. The many Red Sox fans in the crowd cheered loudly. It was the first run Hellickson had allowed at Tropicana Field in 25 innings. Beckett had faced the Rays once since April 30, 2009. He certainly appeared to be a mystery to them last night. He retired the first eight batters in order before the lefthanded-hitting Brignac slapped a ball down the third-base line. Youkilis, playing off the line, could not make the throw in time. Youkilis couldn’t believe Brignac made contact on the pitch. Brignac took second when Beckett’s pickoff throw went awry. But Beckett struck out Johnny Damon looking at a full-count fastball low and on the outside corner. The Red Sox have won nine of their last 10 games and are 7-1 on a road trip that ends tonight with Clay Buchholz facing David Price.